And the first whitewater slalom medal in Rio goes to….France! Denis Gargaud Chanut of France inherited the mantle of French canoe slalom great (and three-time C-1 gold medalist) Tony Estanguet as he won France’s seventh Olympic Games gold medal in C-1 slalom at Rio’s Whitewater Stadium on Tuesday. Chanut held off the challenge of Matej Benus of Solvakia and Japan’s Takuya Haneda to clock the fastest run in the men’s C1 final. Casey Eichfeld of the U.S. finished 7th. “It was a very great moment for Tony to bring me this medal because there is a sort of transfer between us,” said Chanut. “It has always been presented to me that I was inheriting from the family of Estanguet because he did a lot of good things in the canoe slalom family. It’s a big accomplishment for my family, for my friends, for my team, for my coach, for everyone that supports me. 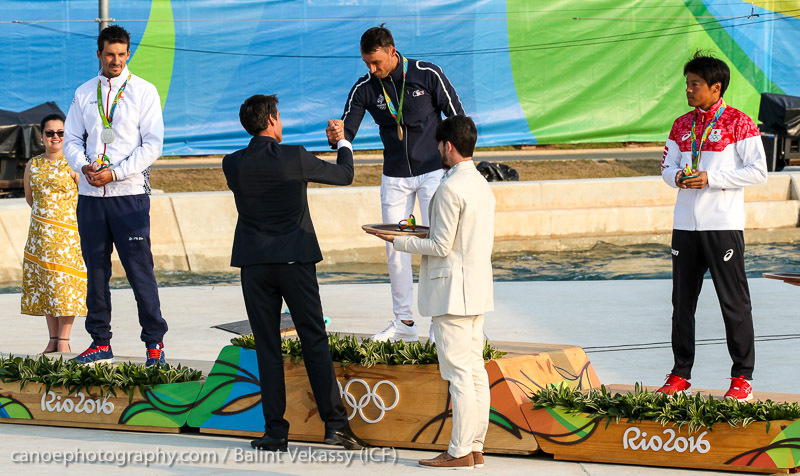 In the first Olympic Games canoe slalom competition since 1992 to not feature Slovakia’s Michal Martikan on the podium, never mind in the race, it was fitting that the man who edged him out in Slovakian team qualifying for Rio 2016 should claim the silver medal. As for Eichfeld, he’s psyched with his finish, taking seventh in the men’s C1 canoe slalom competition at the Whitewater Stadium in Deodoro X-Park. Benus shaved over five seconds off his first run time to win the silver. “I am very happy to win this medal for Slovakia and I am following in Martin’s steps,” he said. Beijing 2008 silver medallist and two-time world champion David Florence (GBR) hit two gates and finished last.